3rd Grade: We ended up not having a party because of a riot at the high school. Yes, I said riot. We got out of school early because of the teenagers being stupid. This was the first year of integration in the Small Town. As you know, February is also Black History Month. Are they still calling it that, or are they being politically correct now and saying "Africa American History Month"? Hm. Anyway, it was pretty scary when you're 8 years old and you get out of school because of a riot. I remember being at home, sitting at the table with my brothers & sisters, and somebody (I can't remember which one) was late coming in. Mom was worried (Mom is a worrier) until all her chicks were back in the roost. My second oldest sister (who was a junior) came in with a scratch on her arm. She ran into a locker on her way out of the school. I envision the school being crazy, with the students running uncontrollably down the hall, trying to get out. Was it really that way? I don't know. I need to check with my older siblings and get the real story. I remember all of my classmates thinking it was real stupid of those older kids to act that way. About the Valentine Party: I can't remember if we actually had the party the Monday we got back (the riot was on a Friday) or if we were given our Valentines before we left. I've put the word out on Facebook, so hopefully someone will have a much better memory than I! Isn't he a sweetheart? 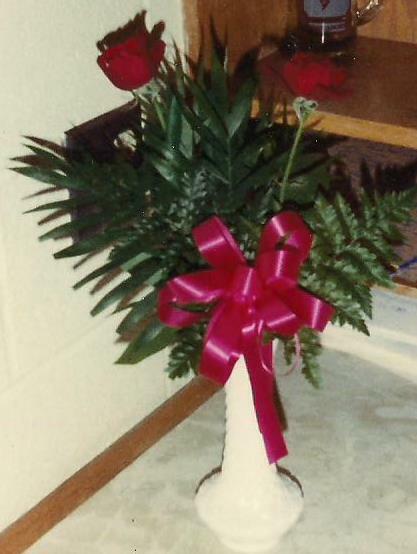 I think those were the first flowers I had ever gotten from a guy, not counting the corsages from dances. This friend had broken up with his girlfriend, who happened to be my sister's roommate. He was such a good friend, but, unfortunately we went our separate ways after a year or two. I actually ended up seeing a good friend of his for a while, but the guy's girlfriend kind of put a stop to that! (OOPS!) He actually ended up being a good friend, too. I try to make Valentine's Day quasi-special for my boys. I usually get them a little heart of chocolates and some Valentine's Boxers, but decided to change it up some this year. I sent OS some cookies, took some brownies to MS, and made some cookies for YS. After hearing endless whining some complaints from CH, I mixed up some made-from-scratch brownies for him. All 3 boys also got a brick shaving bar from Boll Weevil Soap Company. This scent is a really manly scent, in my opinion, anyway! Hope they like it! MS got his yesterday, YS got his this morning, and OS will get his as soon as it gets to the post office at school. Hope the cookies get there without being all crumbled up! I have the hardest time getting anything for CH. Last year I think I got him a package of pistachios. Big spender, huh? We've never been big on celebrating Vday. Hubby gave me a card and some sportsbeans this year. haha Actually it is a great gift for me. We always get the kids a little something and this year I banned stuffed animals. The kids were slightly disappointed until they got their gifts. We will spend our night like any other night...I'm headed out to run 4 miles when I get off work and hubby will do the same when he leaves track practice. Then when we get home we will have dinner and chat about how sore our legs/bodies are from all the running, call it an early night so we can get up and start the same routine in the morning. Ha! We are such romantics. Valentine's Day is pretty much another day. Hub and I exchange cards, share some memories (we got engaged on Valentine's Day), then get into the day. I've never been to a Valentine's party, have never had a desire to go to one, which is good, because I don't know anyone who's hosted a VParty! LOL! That riot situation wasn't a pretty scene. As a former high school teacher, I question the school's leadership, ie, the principal, policies in place, relationship with student leaders, and so on. Something's not right here. You're wise to move on! What sweet gifts. I was lazy this year and didn't do anything special for the kids. Now I feel bad :( Happy Valentine's Day! I am spending my day with a friend in Alex City because we have bible study tonight. Frank is by himself...but then...we don't really do Valentine's Day. Happy Valentines Day to you my friend! If you do find any more information about that riot, it would be interesting to share it, if you decide to. I'm sure it had to make such an impact to cancel elementary parties, etc. that was sweet for your friend to send you flowers to help you through that difficult time. I've tried to keep Valentine's Day simple when the kids were growing up, like you did, box of chocolate, stuffed animal, etc. Always good to focus on less commercialization of the day, know what I mean? I hope however you spend it, it is a good one for you and yours! Happy Valentine's Day. You've had some interesting ones in the past. Mine have all been boring. Oh my! A riot in 3rd grade? I am surprised you weren't scarred for life!!! We spent it with chocolate fondue - our favorite thing to do for Valentine's Day.